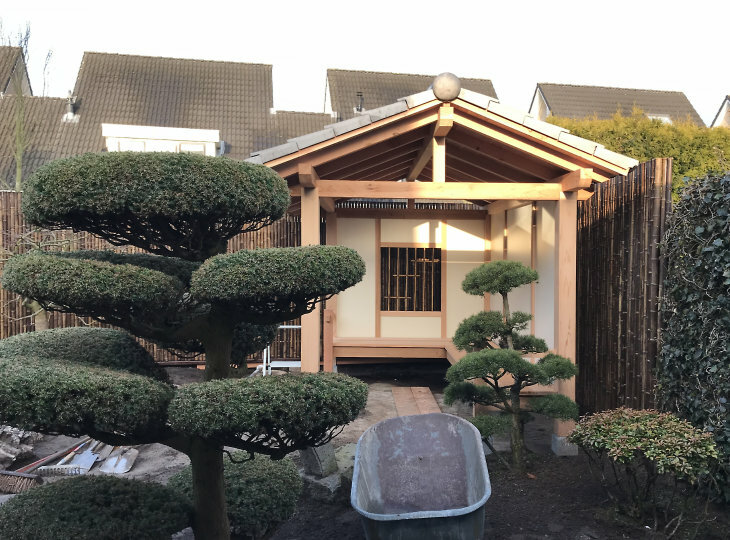 This client in Almelo, the Netherlands already had a garden with Japanese influences and thought about upgrading the garden to a more authentic Japanese design. 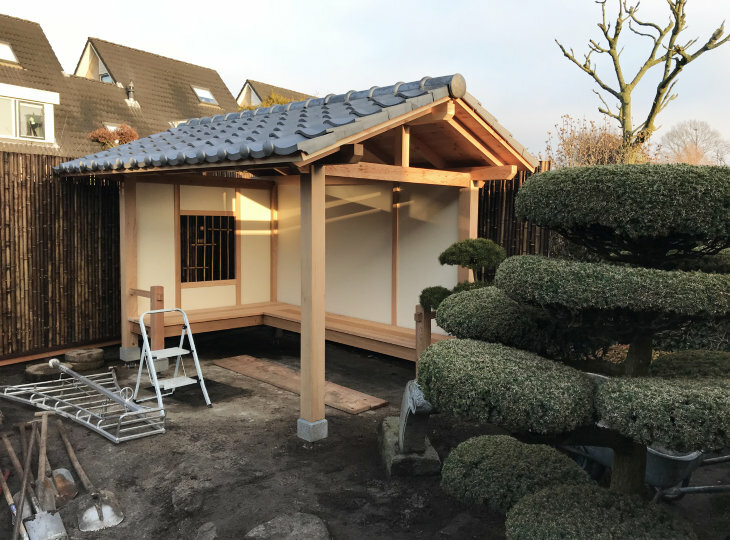 In the new design was also a Japanese guardhouse, in Japanese a 'koshikake' included. 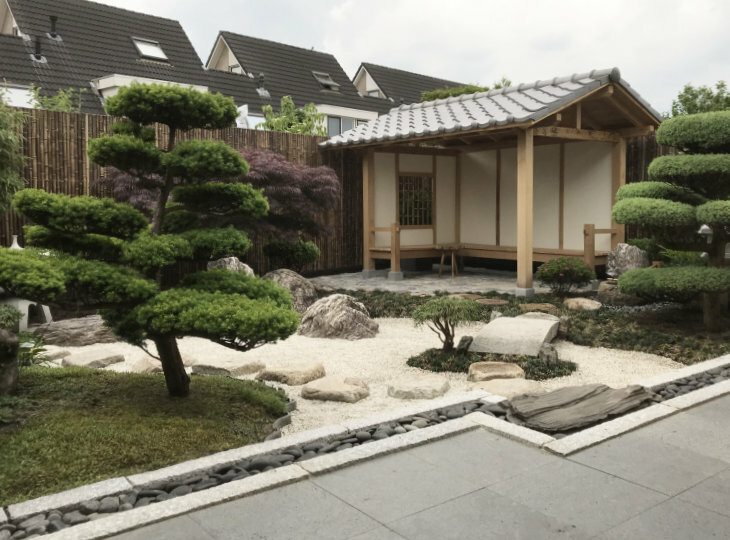 The koshikake is mainly found in the Japanese tea garden. 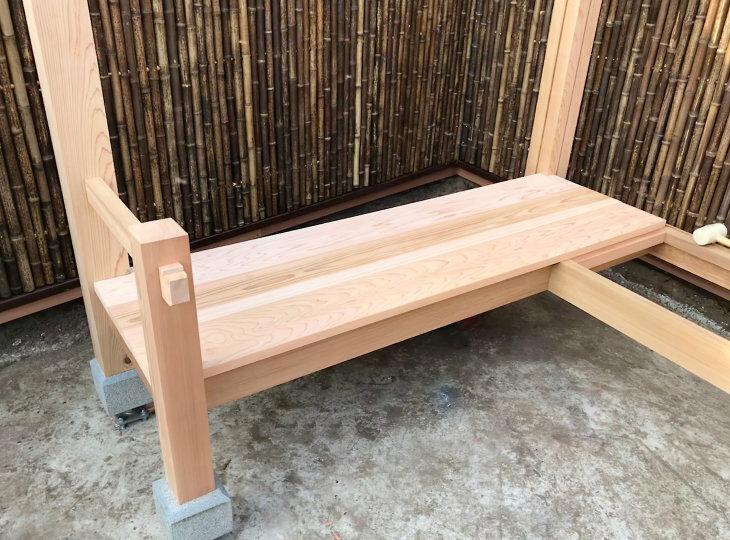 It is a covered bench where the visitors take a seat before they enter the tea room and after they have been in the tea room. 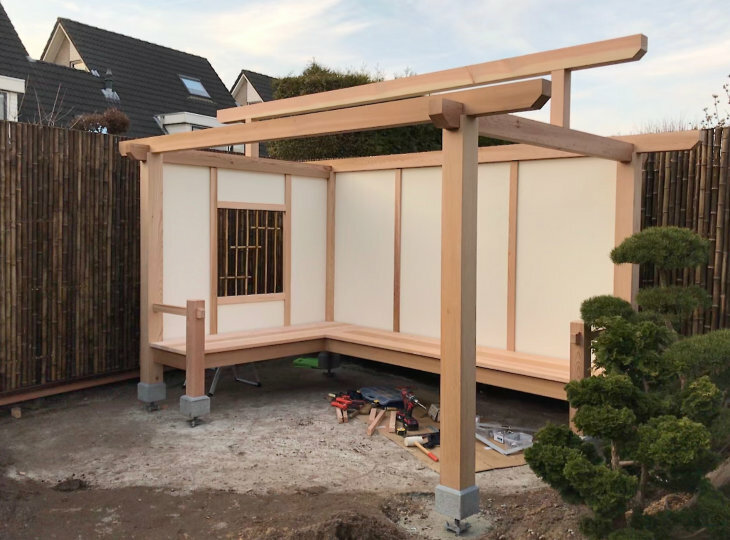 However, the customer wanted a larger version of the koshikake with a comfortable sit to enjoy the garden. 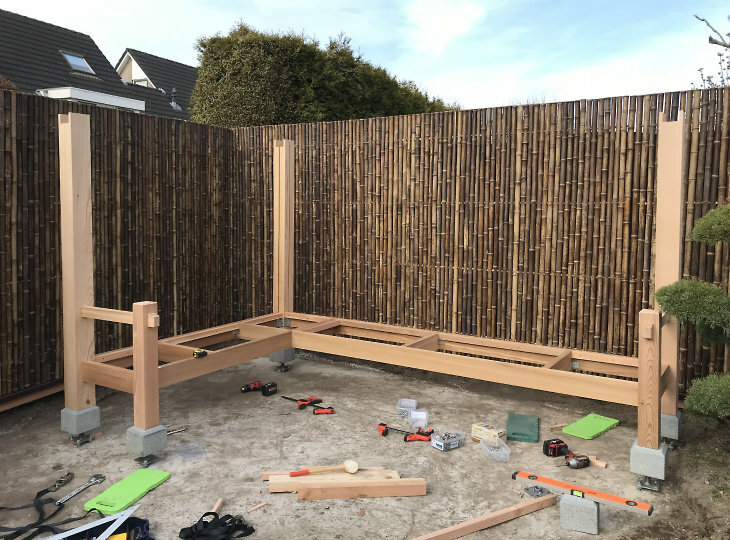 The koshikake is built with Western Red Cedar combined with Siberian larch. 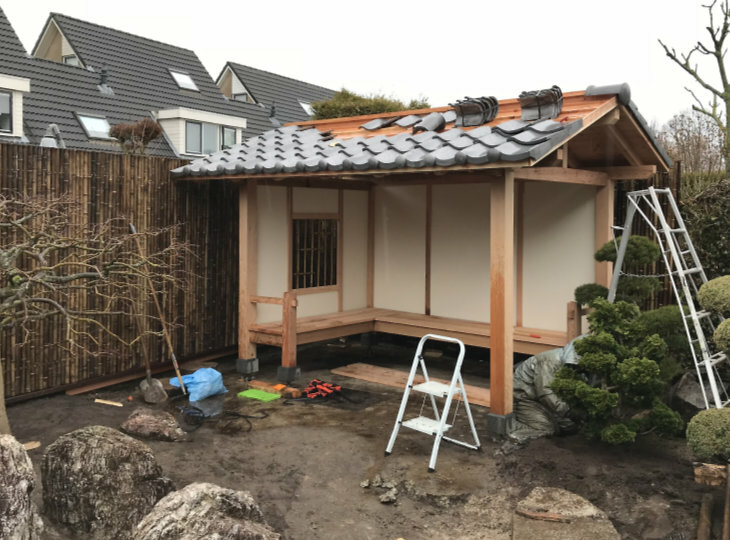 The roof is fitted with traditional Japanese ceramic roof tiles. 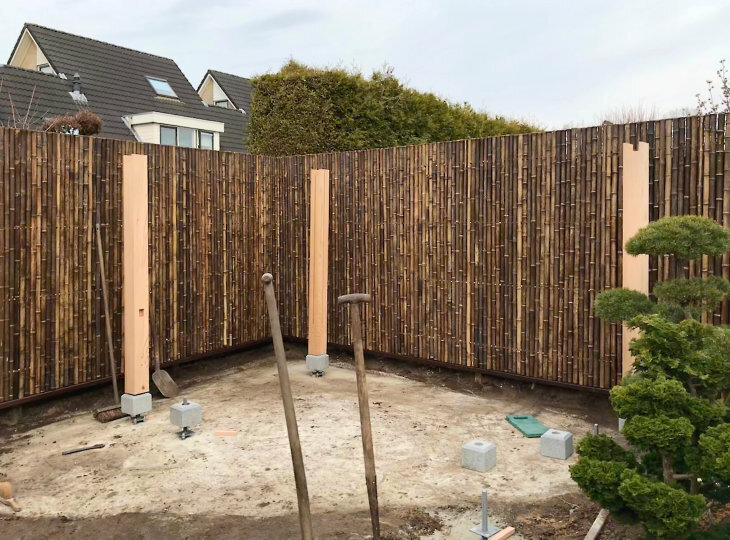 The restyling also meant that parts of the existing garden had to be redesigned. 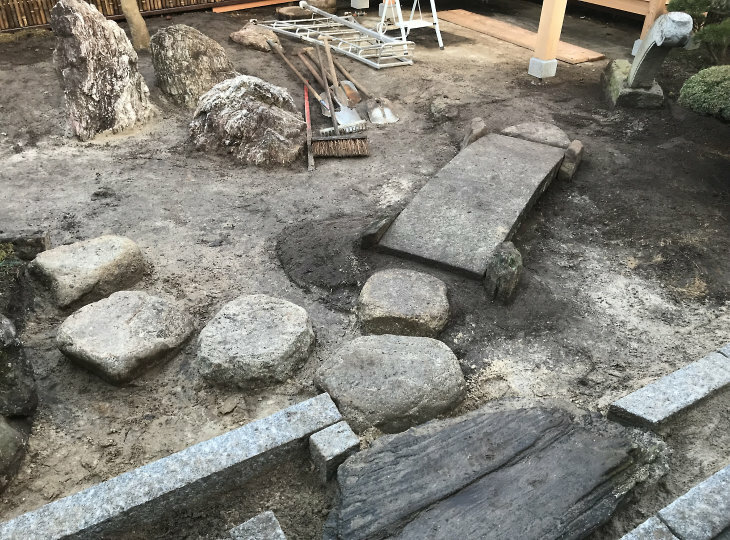 For example, a stepping stone path, called 'tobi-ishi' in Japanese, was constructed which forms the connection between the terrace and the koshikake by means of a granite bridge. 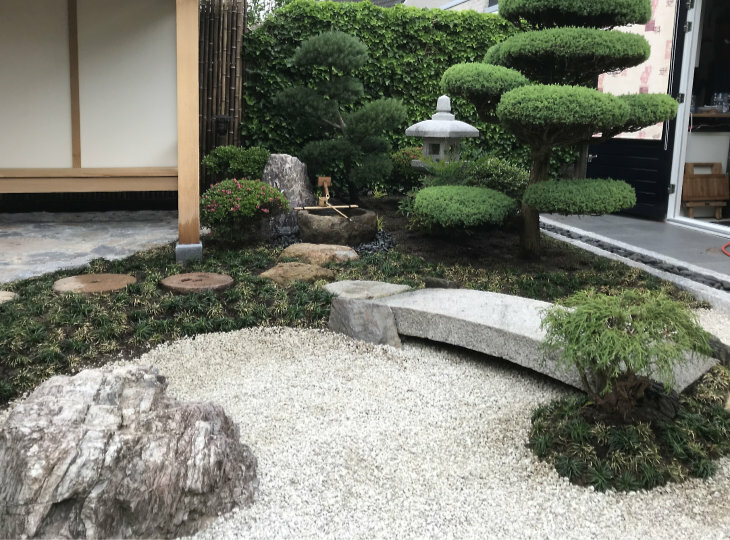 There is also a rock formation placed in the traditional 'san-zon-seki' setup and there are some solitary rocks set here and there. 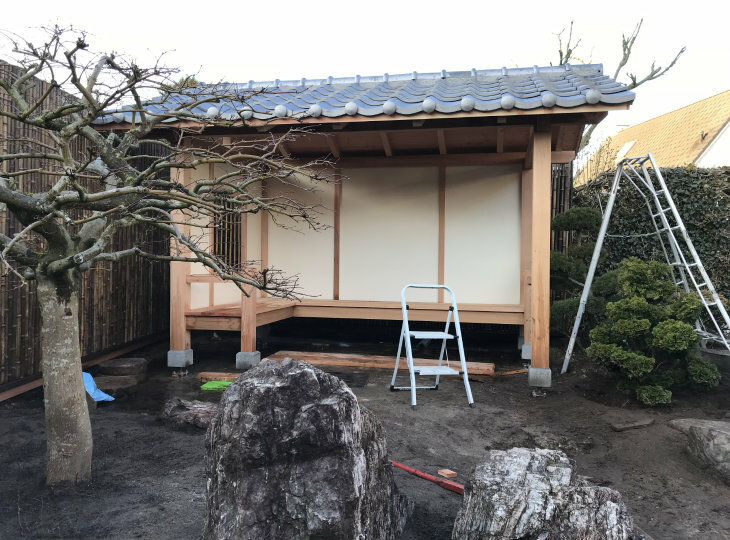 To give more dynamics to the garden, a row of tiles has been removed from the existing stone terrace. 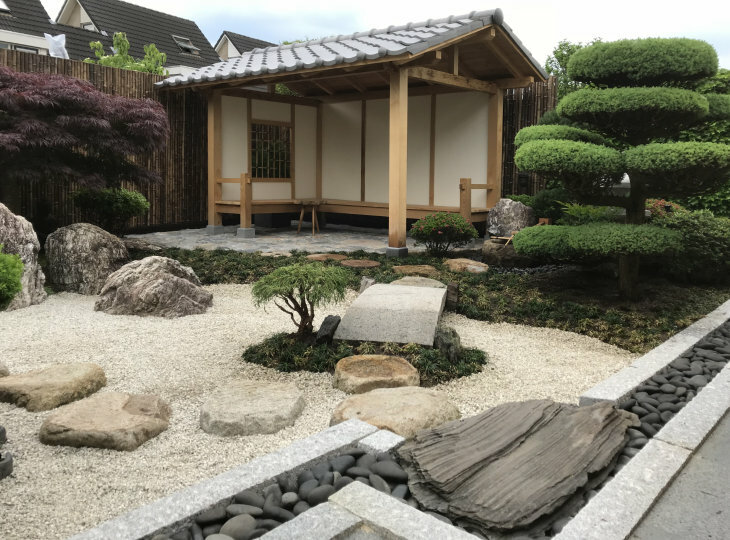 In the resulting 'corner' a so-called 'kutsu-nugi-ishi' is placed which forms the 'bridge' between the terrace and the stepping stone path. 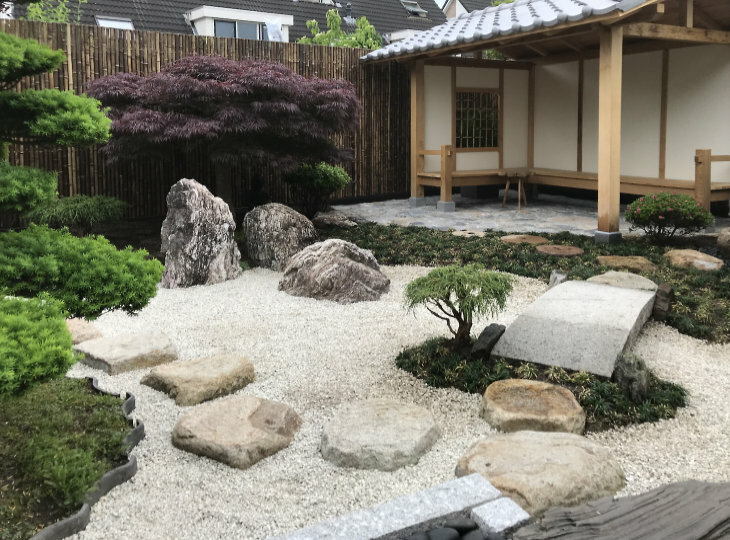 The gravel areas are separated from the terrace by a so-called 'sokkou', consisting of a double row of granite curb stones with black pebbles in between. 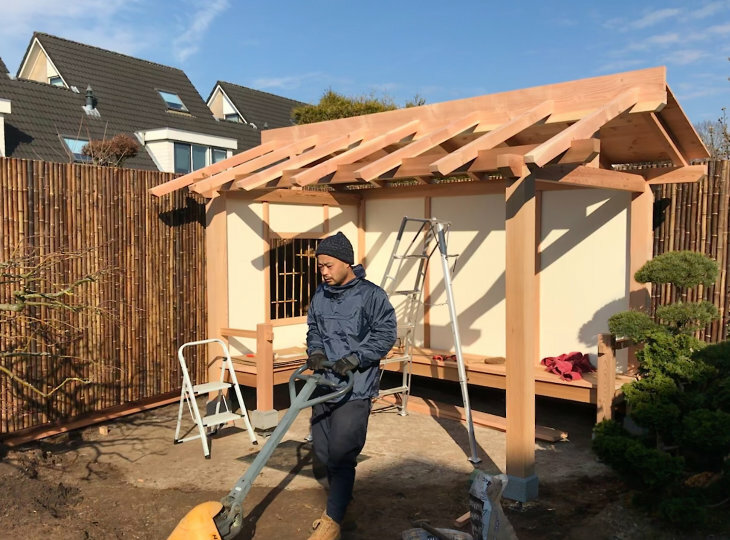 In addition to the cosmetic effect this sokkou also holds drainage to drain the excess water from the terrace at heavy rains. There are also two Japanese lanterns placed. In the back of the garden there is a beautiful Yukimi gata on the left, a so-called snow lantern. 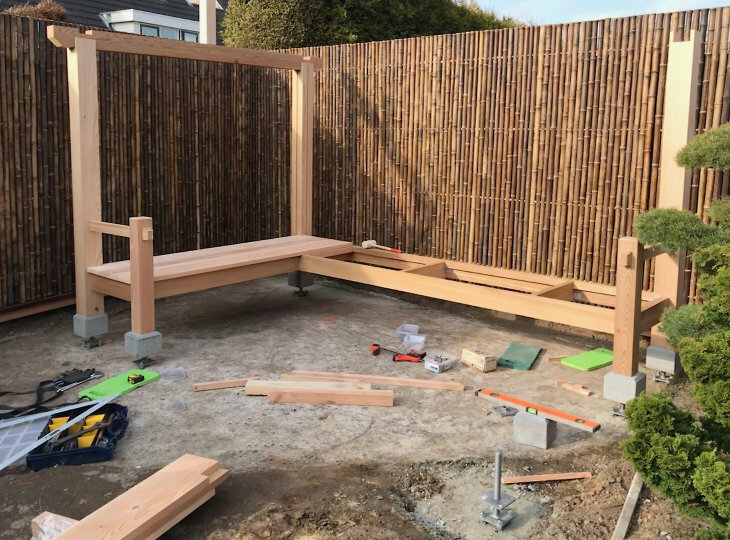 To the right of the koshikake a tsukubai setup has been realized behind which an Oribe lantern is placed. 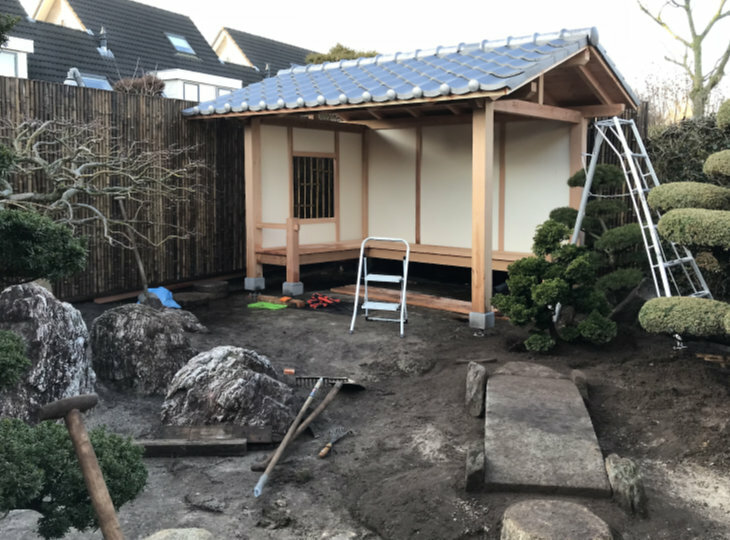 The planting has been supplemented with among others Japanese Azalea bulbs, Taxus bulbs, Leptinella, Ophiopogon and some accent plants.